Bring your special someone in Thursday, February 14th, 2019 to celebrate Valentine's Day with an awesome heart shaped pizza! 14" heart shaped cheese only $11.99. Additional ingredients extra. Cannot be combined with any other offer. We open at NOON on Sundays for NFL season! Dine-in, carry out and delivery!! Join our Text Club for exclusive offers!! Text "JIMBOS" to "36000"
Tuesdays....20% off ALL pizzas, ALL day!! Wednesdays...40% off pizza after 7PM! Click below for more offers and specials. Kitchen & customer service..nights & weekends. Apply in person. Famous Chicago Style pizza and more! 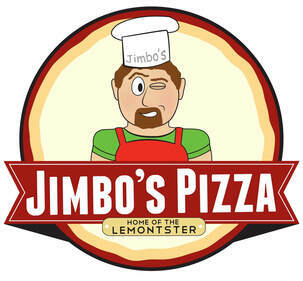 ​Jimbos is the Home of the" Lemontster"
19 inches of PIZZA DELIGHT!